This year again BMQG was invited to be part of the LQF. I have some quilts in display there. It has been an honor to be the part of the show. The BMQG LQF committee has worked hard to put together this show. I will be at the show tomorrow and be back with more lovely pictures of these modern quilts from our BMQG members. 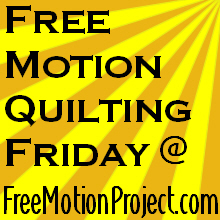 Now linking up with Leah Day's FMQ Friday. So prolific this year!!! Awesome!! Those swirling feathers in the top picture are amazing! Thank you, Jenny! Those I learned from Angela Walter's craftsy class - Free Motion Quilting Feathers. It was fun to quilt.